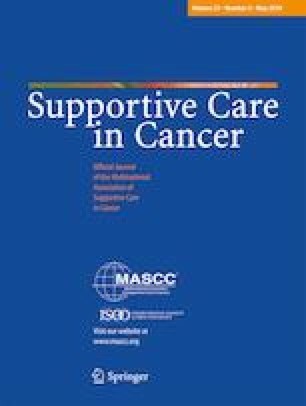 This is the first study to determine the minimal clinically important difference (MCID) of the European Organisation of Research and Treatment of Cancer Quality of Life Questionnaire-CIPN twenty-item scale (EORTC QLQ-CIPN20), a validated instrument designed to elicit cancer patients’ experience of symptoms and functional limitations related to chemotherapy-induced peripheral neuropathy. Cancer patients receiving neurotoxic chemotherapy completed EORTC QLQ-CIPN20 and the Functional Assessment of Cancer Therapy/Gynecologic Oncology Group-Neurotoxicity [FACT/GOG-NTX] at baseline, second cycle of chemotherapy (T2, n = 287), and 12 months after chemotherapy (T3, n = 191). Anchor-based approach used the validated FACT/GOG-NTX neurotoxicity (Ntx) subscale to identify optimal MCID cutoff for deterioration. Distribution-based approach used one-third standard deviation (SD), half SD, and one standard error of measurement of the total EORTC QLQ-CIPN20 score. There was a moderate correlation between the change scores of the Ntx subscale and sensory and motor subscales of QLQ-CIPN20 (T2: r = − 0.722, p < 0.001 and r = − 0.518, p < 0.001, respectively; T3: r = − 0.699; p < 0.001 and r = − 0.523, p < 0.001, respectively). The correlation between the change scores of the Ntx subscale and the QLQ-CIPN20 autonomic subscale was poor (T2: r = − 0.354, p < 0.001; T3: r = 0.286, p < 0.001). Based on the MCID derived using distribution-based method, the MCID for the QLQ-CIPN20 sensory subscale was 2.5–5.9 (6.9% to 16.4% of the subdomain score) and for motor subscale was 2.6–5.0 (8.1%–15.6% of the subdomain score). The MCID for the EORTC QLQ-CIPN20 established using distribution-based approaches was 2.5–5.9 for the sensory subscale and 2.6–5.0 for the motor subscale. When noted in assessments even with small change in scores, clinicians can be alerted for appropriate intervention. The authors would like to thank the participants for their contribution to this study. Herewith I state to have full control of all primary data and that I agree to allow the journal to review our data if requested. The study was approved by the institutional review boards of each participating institution (National University Health System, Singapore; Queen Elizabeth Hospital, Hong Kong; University of Manchester, UK). All procedures performed in studies involving human participants were in accordance with the ethical standards of the institutional and/or national research committee and with the 1964 Helsinki declaration and its later amendments or comparable ethical standards.